Roshan was born as Roshan Lal Nagrath in a village of Gujranwala (Now in Pakistan) on 14 July 1917. He began to learn music from an early age . his first Guru was Manhar Barve. He travelled India with him . He studied music at the Morris College of Music, Lucknow. He took music lessons from Ustaad Allauddin Khan and later he joined the 'Sarangi King' Bundu Khan, to learn Sarangi. He got associated with All India Radio (Delhi) as a musician, in the early 40's, for almost 10 years. He use to compose music for various radio programmes. He came to Mumbai to pursue his career as a music director ,in 1948. Struggle followed before he met Kidar Sharma. In those days Kidar Sharma was making Neki Aur Badi and whose music was being looked up by music director Snehal Bhatkar. But, Kidar was so impressed by Roshan that he took him for his film after discussing the matter with Snehal Bhatkar. Roshan composed the music for Neki Aur Badi (1949), unfortunately the film was a flop. Inspite of the result Kidar offered Roshan his next venture Baawre Nain (1950). Roshan started freshly with the new assignment, this time he broke through with hits like 'Khayalon Mein Kisike..', 'Sun Bairi Balam..' and others. 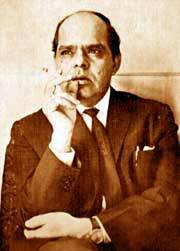 He had a good alliance with Talat Mehmood and Mukesh in the 1950’s. In the 50’s, Roshan gave hits like Malhar, Shisham and Anhonee and some of his songs were amazingly modern in tenor for those times, like, 'Taare Toote Duniya Dekhe..' from Malhar. However his low profile approach did not win him great prominence commercially, though he was respected by his colleagues immensely. Roshan also gave major breaks to later big names like Indeevar (Malhar) and Anand Bakshi (Vallah, Kya Baat Hai, Devar etc). His biggest strength was that he was very comfortable in mixing the folk music with the complex classical tunes. He use to make a fusion of folk and classical music and that too with ease. This was the speciality which belonged to Roshan only. It was his approach which made his music stand out from the others. In the 60’s, Roshan gave hits like,Barsaat Ki Raat, which featured hits like 'Na To Karavan Ki Talaash Hai..' and 'Yeh Hai Ishq Ishq..', Aarti ('Ab Kya Misaal Doon..'), Devar ('Baharon Ne Mera Chaman Lootkar..'), Bheegi Raat ('Kahin To Milegi..', 'Dil Jo Na Kehsaka..'), Chitralekha ('Sansaar Se Bhaagte Phirte Ho..', 'Man Re Tu Kahe Na..'), Taj Mahal ('Jo Wada Kiya Who Nibhana Padega. ', 'Paon Choo Lene Do..'), Bahu Begum ('Hum Intezaar Karenge..' and 'Pad Gaye Jhoole..'), Dooj Ka Chand ('Mehfil Se Uth Jaanewalon..'), Nai Umar Ki Nai Fasal ('Carvan Guzar Gaya..' and 'Dekhti Hi Raho Aaj Tum..' ), Dil Hi To Hai ('Nigahen Milane Ko Ji Chahata Hai..' and 'Laaga Chunri Me Daag..' ) and finally his swan song from Anokhi Raat ('Oh Re Taal Mile..' and 'Mere Beri Ke Ber..'). He had been suffering from chronic heart problem for more than 20 years.He died of a heart attack on 16 November 1967. His untimely demise caused a great loss to the film industry. He left behind his wife and sons Rakesh and Rajesh Roshan. In the 70's Rakesh made his entry into the film industry as an actor., while, Rajesh is a noticeable music director. In the late 90's Roshan's grandson Hrithik Roshan made his successful debut in the film industry with Rakesh Roshan's Kaho Na Pyar Hai.